Before you go ahead and use any of these methods, it is advisable to take a backup of the PST file and make a note of the user ID and password, as you may need them after the repair or reinstall is finished. While repairing does not harm current profile and data, you should always be on a safer side. Also, if you are reinstalling Outlook, you will have to create a new mail profile after the Outlook is installed. And with that profile, you will be able to open the existing PST file so do not forget to take a backup of current PST file. Also note that whether you are repairing or reinstalling, you will need Office or Outlook CD or the exe file using which the process can be completed. Step 1: Exit MS Outlook and all other applications of MS Office. Step 2: Click Start > Control Panel. Step 3: Look for Add or Remove programs and click that. A window will appear. Step 5: Click Change if you want to repair else click Uninstall. These are the initial steps to repair or reinstall Office or Outlook, and are same for all versions. However, depending upon the version of MS Office or Outlook and/or the option you select, the later steps may vary so you should follow the on screen steps after the initial steps. For example, if you select the Change option in Office or Outlook 2007, 2010, and above versions, then you will get two options: Quick Repair and Online Repair to fix Outlook or Office installation. You can follow any of these options to fix the problem. If you feel the problem is minor then select the Quick Repair option else go ahead with Online Repair. 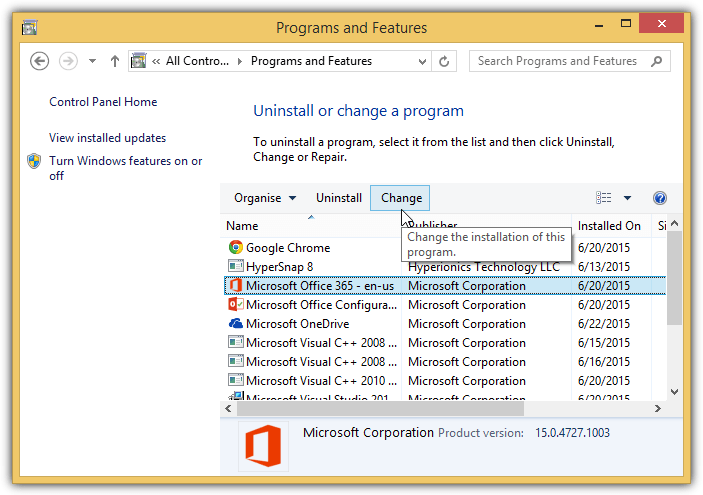 And, if you select the Uninstall option, then you first need to uninstall the existing Office or Outlook and then reinstall using the installation CD or exe file stored in your machine. It is advisable to go ahead with repair first because most of the times, it fixes the issue while saving your time as well. If the problem does not fix with repair then only prefer the reinstall process.